If you are interested in archery and have little experience you will need to complete a beginners course before joining any archery club. Each summer the club organises and runs beginners courses. These courses are for anyone wishing to take up archery as a sport and to join the club at the end of the course – they are not archery Have-a-Goes. If you wish to just try archery to see if it is for you, then use the Have-a-Go contact form below, do not use the beginners one. On the Beginners Courses, anyone from the age of 10 is welcome and all equipment is provided. Juniors under the age of 12 must be accompanied by a parent or guardian and as this also applies if they subsequently join the club we strongly advise parents to consider doing the beginners course themselves so that they can also shoot. The course consists of five one-hour sessions on Wednesday evenings. Please see our FAQ page for some commonly asked questions. The club is having to find a new shooting ground for 2019, so we have not yet set any dates for beginners courses in 2019. If you wish to go on a waiting list for beginners courses that we may run in the future, please click on the Beginners Organiser Contact Form to leave a message and your details. If you have completed an RLSAS beginners courses and would like to join us you would be most welcome. Please click on the Membership Secretary Contact Form to leave a message and your details. We are quite happy to accept new members who have previously been members of the AGB and those that have recently completed an approved beginners course. It is important to note that it is a condition of the AGB insurance that all novice archers must have completed an approved beginners course. In both situations we need to check your ability and as such please click on the Club Coach Contact Form to book a time for an assessment. We strongly advise novice archers not to rush out and buy equipment before joining, however tempting that may be. Those who have completed an RLSAS beginners course may use the club bows for a while during club target sessions (Wednesday evening after beginners, Friday evening and Sunday morning) so come along and talk to us about what you will need. That way you can try before you buy, benefit from the experience of the other club members and maybe find suitable second hand equipment (there is an active facebook group for second hand archery equipment). As of May 2018 we will not be able to hold any Have-a-goes until further notice. This is because we will be moving to a new venue to shoot. As soon as this has happened, we will update this page and normal service will resume. We would like to thank all who have had HAG’s with us in the past and look forward to seeing you again in the future along with any other clubs, groups or organisations who wish to give archery a try. 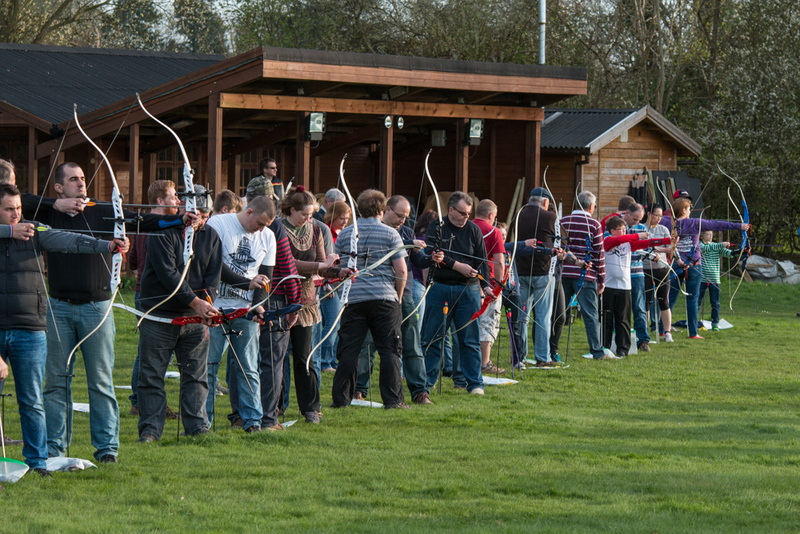 The club is committed to publicising and promoting archery as widely as we can. To this end we do Have a Go sessions on our own ground at Old Leamingtonians RFC, for clubs, societies, schools and work groups. 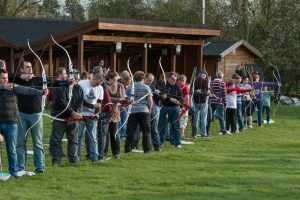 HAG’s are a more informal introduction to archery and are not a beginner’s course, but for people who just want to try something different by way of an evening out. These sessions are particularly popular as works or office outings. We can take pre-organised groups, minimum of 10 and maximum of 20 people. The session consists of two hours shooting (7-9 pm), ending with a short, friendly competition and certificates will be given to the winning adult and children. Anyone from the age of 10 is welcome and all equipment is provided. Coaching support is provided by RLSAS club members and we will also provide light refreshments (coffee, tea, squash and biscuits) at a break half way through the evening. A Have a Go session can usually be arranged on a mutually agreeable Monday, Tuesday or Thursday evening, in the month of May, June or July. You will need to be at our ground for 6:45pm. If you are interested in a HAG for your group or works, please contact the organiser by email (below) for prices, giving a couple of dates and the size of your group. The organiser will then get back in touch with you to confirm a date. Please book well in advance since we can only do a couple of HAG each year. We occasionally put on “Drop In” Have a Go days. The dates will be advertised in and around the local community as well as on our own web site. A drop in HAG which runs on a Saturday between 10am and 4pm, for individuals or families to come along and shoot a few arrows, usually a dozen, under the supervision of one of our club members. The drop in is free but we may have bucket out collecting voluntary donations for a local charity. If you are interested in coming to one of these days contact the HAG organiser and ask to be put on the contact list for when the dates are official.